James: When Rachel Cooper loses her left hand in a boating accident, she experiences phantom pains in her missing limb, as many amputees do. But her sensations develop into an ability to touch the shadowy realm of the umbra which lies behind reality. She discovers that she can bring things through from the umbra – usually it’s just junk (things like dead leaves and bits of rubble, basically the detritus of the living world), but every time she does it she disturbs the balance between life and death and the umbra lashes back in reaction. Then she encounters a human hand, and accidentally pulls through a woman who has no memory beyond that her name is Mary, at which point hell literally breaks loose. Figures emerge from the umbra to reclaim Mary, and the only way they can be defeated is if Rachel can help Mary to figure out who she is and how she died, but the answers lie in a dark secret buried in the past of Rachel’s own family. DJ: What were some of your influences for The Hollow Tree? James: It’s based on a real-world unsolved murder mystery from the Black Country known as the ‘Bella In the Wych Elm’ mystery. Towards the end of World War 2, some lads poaching in Hagley Woods discovered the skeletal remains of a woman who had been stuffed into the hollow trunk of an ancient elm tree. Despite extensive investigations, neither her identity nor the circumstances of how she died were ever established, let alone who her killer was. It didn’t help that the chaos of wartime meant that many records were lost, and even her remains – which were originally sent to Birmingham University for forensic testing – disappeared so there’s never been a chance to apply more modern methods such as DNA-testing. But within a few days of the police appealing to the public for more information, a piece of graffiti appeared which said ‘Who put Bella down the wych elm?’, which is where her name came from but, as I say, no Bella was ever reported missing. That graffiti pops up from time to time, notably on an old monument in a field near Hagley, except that ‘wych’ has become ‘witch’, and of course all sorts of myths have spring up about who ‘Bella’ was. Some say she was a gypsy witch, sacrificed by her coven. Some say she was a German spy, murdered for betraying her contacts’ secrets. Some say she was a prostitute, strangled by a soldier. All of those myths have made it into the novel in some form or another. James: Well there’s Rachel, who’s having to cope with not just the physical trauma of losing a hand but the weird paranormal phenomena which follow. There’s her husband Tom, who’s in over his head and only wants to protect his wife, which leads him to make a terrible mistake. There’s Mary, of course, and her three ‘incarnations’ – Annabel the gypsy, Eline the spy, and Daphne the prostitute – each of whom has her own tragic backstory, and the three deaths which come from the umbra, feuding with each other over who gets to claim her soul: the Small Man, the Green Man and the Dark Man. There’s also a cat called Smoky. DJ: What is the world and setting of The Hollow Tree like? James: This is a contemporary supernatural thriller, so it’s our world. The world of the umbra, however, is the dead and discarded husk of our world, inhabited by the shades of those dead souls who can’t move on the next stage of existence, and who shape the umbra with their faded memories. DJ: What was your favorite part about writing The Hollow Tree? James: I’m not going to say it was necessarily fun, but getting out into the woods where Bella’s body was found and going through the old police files was by far the creepiest and most interesting part of the research process. As the murder has officially been closed as unsolved, the files are available for public access at the Hive, Worcester’s main library and archive. It’s one thing researching internet sources from the comfort of a computer screen, but when you handle the same photographs of Bella’s remains that the police themselves used, and walk in the same woods where she died, it makes the weight of her reality that much heavier. She becomes more than just a meme or an entry on someone’s blog page. Never mind that in my novel the murdered woman is a fictional character with a different name, Bella was real, and it was important to me to respect that as best I could. James: Who’s going to play Mary in the Netflix series, I hope. I don’t know. I try not to second guess what’s going in anybody’s head. Being in my own is weird enough most of the time. DJ: Did you have a particular goal when you began writing The Hollow Tree? Was there a particular message or meaning you are hoping to get across when readers finish it? Or is there perhaps a certain theme to the story? James: Yes. The victim is never to blame. The perpetrator is never worth the attention. Why, when a young woman is abducted, assaulted, or murdered, does the killer (who is invariably male) get his face plastered all over the media like he’s some kind of celebrity? Why, for example, is the identity of Jack the Ripper the big problem to be solved and not, for example, the fact that women today are still forced into the same desperate conditions that his victims endured over a hundred years ago? Why, when a woman dies anonymously like Bella, are her only options that of witch, spy or prostitute? I have two daughters – both young women in their twenties – and sometimes I fear desperately for the way they will be treated as they grow into their own lives. I genuinely hope that the momentum of the #metoo movement delivers real change for the better. DJ: When I read, I love to collect quotes – whether it be because they’re funny, foodie, or have a personal meaning to me. Do you have any favorite quotes from The Hollow Tree that you can share with us? DJ: Now that The Hollow Tree is released, what is next for you? James: I’m currently working on a project for Titan about the Black Death and ancient parish boundary stones and generational curses, which is still at a very early stage. DJ: Before we go, what is that one thing you’d like readers to know about The Hollow Tree that we haven’t talked about yet? James: This novel developed out of a very short story I wrote for a competition run by the website Den of Geek. You can buy the resulting anthology at http://amzn.eu/gNMads9 and all proceeds go to cancer research. James: Only to say thanks for giving me this opportunity to blather on about my book. 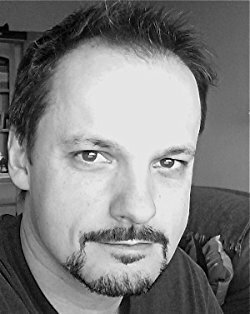 James Brogden was born in Manchester in 1969, and lives with his wife and two daughters in Bromsgrove, Worcestershire, where he teaches English. His short stories have been published by the Big Issue, the British Fantasy Society’s Dark Horizons, Alchemy Press and Anachron Press. His first novel, ‘The Narrows’, was published by Snowbooks in 2012, and the follow-up – ‘Tourmaline’ – in 2013. When he’s not writing or trying to teach children how to, he gets out into the mountains whenever he can, exploring the remains of Britain’s prehistoric past and hunting for standing stones. Fortunately they don’t run very fast. I really love how it’s based on a real-life mystery. I’d actually like to learn a lot more abou that! Awesome interview! 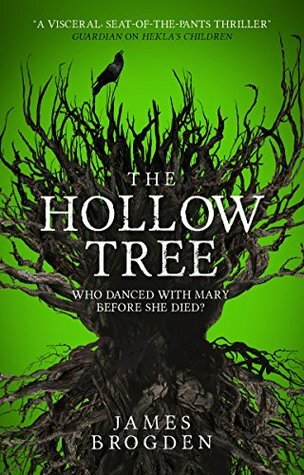 James also wrote a very cool guest post for us which will be going up later this week, and I can’t wait to read The Hollow Tree.